Originally when glass recycling began, glass was considered a hazardous waste and dangerous product. The system that was introduced was a Closed Loop system. This meant that all glass had to be segregated into their separate colour’s before the recycling process could be carried out. This system caused more problems than cures. The technology we use is a system created and patented by ourselves. The plant can handle half the glass in the country with this system. We can crush 87,000 bottles an hour from its raw material into a glass cullet & then into a sand. The glass is collected or delivered to the quarry unsegregated. The resulting glass has different sizes from 12mm to 1 mm. This product is entirely clean & safe to handle. In the glass making process it has already been heat treated, the sand has a number of useful qualities, including water resistance. The applications to which our glass can be put is limited only by the imagination. The glass is now crushed down into a product that is entirely Clean and Safe to handle. 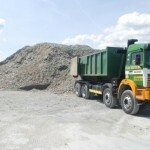 The Recycled Glass is put through a primary crusher and subsequently washed and screened to produce different grades of material, sizing from 12mm down to 1mm fines. This crushed glass product is considered clean and entirely safe to handle. 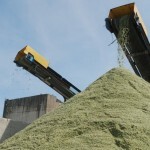 Crushing the glass removes sharp edges, so there is no more danger to workers handling it than there is with sand or gravel.